Green Shirts: Try to keep your outfit light and practical when you are wearing green color shirt especially if you are thinking to wear a casual outfit. Team it with your Oxford shirt with a pair of tan or cream chinos. This combination is perfect for your lunch day out. Finish your look with white color trainers or sneakers. Green Jeans: Wearing green jeans is more adventurous. Style a Oxford blue shirt with your green jeans, this color combination will complement each other perfectly. For footwear, you can go for light brown loafers or tan for a summery look. It's okay if you don't wear socks. 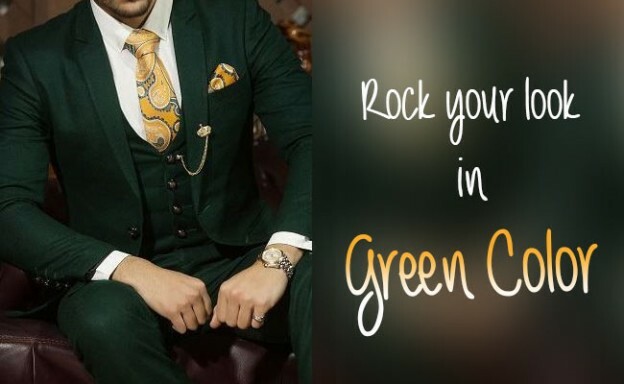 Green Suit: We understand if you wear green all day long you will either look like a pimp or Christmas tree, this can only happen if you spoil your green outfit. When it comes to wear a green suit, then it’s important to know your body size and shape. No matter how great the suit is, but it will look bad if it doesn't fit you properly. Thus, measurements are important. It would be better if your tailor help in measurements. Don't be scared of wearing green color. This can be extremely exciting and fun color to wear. Keep trying with different styles and fun styling green. Don't go for loud green color else it will turn out to be disastrous. Buy green color clothes only if you have a combination in mind otherwise no one is forcing you. So, gentleman! Follow this style guide and wear green effortlessly.